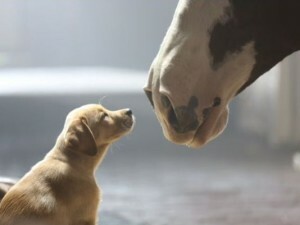 What Can We Learn From Budweiser’s Super Bowl Win? These days, it seems that there are just as many people who watch the Super Bowl for the ads as for the game. Unfortunately, this year, both were overall disappointments. Despite the lackluster performances, one company scored a “Marketing Trifecta.” Budweiser dominated in advertising, social media, and public relations. Budweiser’s other commercial of the night was called “A Hero’s Welcome,” and told the story of a surprise homecoming for a soldier returning to Winter Park, FL. It succeeded in telling the world that Budweiser supports American heroes and small towns and that Budweiser is a responsible corporate citizen. But it was their pre-game social media campaign that really stole the show. By previewing their ads and encouraging people to share them, they created a viral sensation. Mid-week, at least four days before the game, The Puppy Love ad had surpassed 4 million views on YouTube, and continued to climb. Their extended version of the A Hero’s Welcome ad was a moving tribute to our veterans that went viral among veterans groups, their supporters, family and friends. An integrated campaign strategy is the best approach. Budweiser set specific goals, developed a strategy that included advertising, community outreach, social media and public relations, and executed flawlessly. Oh, and…well for the most part, you can’t lose with puppies!